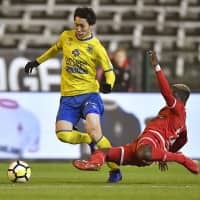 SINT-TRUIDEN, BELGIUM - Midfielder Daichi Kamada scored the eventual game-winning goal for Sint-Truiden in a 3-2 Belgian Cup round of 16 victory against fourth-tier amateur team Mandel United on Wednesday. 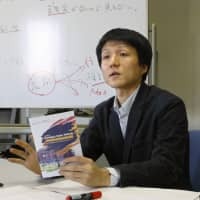 Kamada, who played the full 90 minutes along with teammates Wataru Endo and Takehiro Tomiyasu, made it 3-1 in the 85th minute with his 10th goal of the season, nine coming in league matches. Casper De Norre and Yohan Boli scored the first two goals for the home team at Stayen after a scoreless first half, Kamada setting up De Norre’s in the 59th minute. Daniel Rodrigo de Oliveira leveled with a penalty in the 81st minute and Ruben Pyck scored an injury-time consolation, but it was Sint-Truiden which booked it sspot in the quarterfinals. At Craven Cottage in London, Shinji Okazaki recorded an assist as Leicester City fought back to draw 1-1 away at Fulham. James Maddison scored an equalizer in the 74th minute when he converted Okazaki’s cross from the right, sealing a share of the points and leaving the hosts rooted to the bottom of the Premier League table.